in the words of those who developed, sold & supported it. Thank you all for sharing your memories. The person who did the MightyFrame port was Chris Wagner, since he left Convergent he's been at SGI, NetApp and Iron Mountain. Chris Joined Convergent and the MiniFrame team just as we were making the 1st MiniFrame release. He became the MightyFrame S/W manager. The MiniFrame H/W Manager was Greg Hansen. Greg and Jamie Riotto designed the MiniFrame H/W. Jaime became the MightyFrame H/W manager when the project was created. So Chris and Jaime were the main leads on MightyFrame and probably your best bet for people who may have retained any MightyFrame material. At the time of the MightyFrame Project, Greg was the director of H/W for the Unix division and I was Director of S/W for the Unix Division. Note that the Unix PC was developed in a separate division dedicated to that product. To put these products in context, I'll begin with MiniFrame. The MiniFrame project started about April 1983 when Greg, Jamie and I were both hired. The port was a straight System V plus MiniFrame platform specifics plus BSD VM. About a year later an Ethernet I/O board was added and BSD networking was also added by Tom Faulhaber. There were a number of CTIX releases based on different System V variants but I don't remember the release designations at this remove. AT&T wanted a MiniFrame with an integrated monitor at a lower price point. This lead to a lot of H/W changes and consequently while the Unix PC port started with the MiniFrame, it had a lot of changes and that tree was maintained in the Unix PC division. When Chris did the MightyFrame port, it was based on the System V [5.0.2] release that contained the "Region VM" code. That eliminated the need for the BSD VM of the original MiniFrame CTIX release, but retained the BSD Networking from BSD 4.2 [this work being done by Tom and Andrew]. The MightyFrame source was always ifdef'd for Mini and Mighty, so I think we did a MiniFrame release of CTIX after MightyFrame was released. When AT&T released 5.3 the Mighty/Mini tree merged in support for MegaFrame and UnixPC but that tree wasn't released until after I left Convergent. Unfortunately, over the last 5+ years, I've been pruning my archives of all my old documents and systems. I do seem to have retained a set of CTIX manuals with dates spanning Nov 1985 to May 1986 that seem to be for a CTIX release supporting both MiniFrame and MightyFrame and appears to be the MightyFrame set since it contains the "MightyFrame Administrators Manual" and "How to Write MightyFrame Device Drivers". The set also contains the common material e.g "CTIX Networking". I thought that I'd retained my MiniFrame CTIX manuals [circa 1983/84] but apparently not. My recollection is that for each AT&T technology release for the 3B2 we did a corresponding CTIX release [but I don't remember the CTIX release numbering]. 5.0 1st MiniFrame release and 1st MegaFrame release [separate tree]. 1st Regions VM implementation - though I'm uncertain. The above relates to the CTIX releases for the Convergent Motorola 68K based products. MiniFrame was 10MHz 68010 as was the UnixPC and MegaFrame MightyFrame was a 20 MHz 68020. There were also CTIX releases for an Intel 386 based product. In the 1987 time-frame Greg Hansen was responsible for that product. Chris Wagner, Jamie Riotto, Greg Hansen and Tom Faulhaber are all on LinkedIn. Hope some of this helps. Sorry about the vagueness on some details but it is 30ish years ago. Spent some years with the MightyFrame (and miniframe, megaframe, AT&T UNIX/PC), as a sales engineer, and then as CTIX product manager. Later I taught classes in CTIX admin and C/UNIX system programming. I may or may not have some of that class material laying around, I'll take a look in my storage. But I know for sure that I have no tapes/software, sorry. Carl Rigg did the original kernel port to the miniframe. Tom Faulhaber and Andrew Knudsen did the TCP/IP implementation. Gary Kenney managed the business applications development. Wow, a blast from the past. Yes, I did work on the MightyFrame, and it was quite a project... many years ago (28+). My main job was getting the boot code to work - we ported it from the MiniFrame, which was using the 68010 as I recall, and the big deal about the MightyFrame was we were using the brand new Motorola 68020, a much nicer CPU compared to the 68010. But I don't have any of the materials, or code or documentation. This was well before the concept of open source hit the computing industry, and that OS was proprietary, and licensed from AT&T. So I seriously doubt I'd be of any help to you. But I'm curious - what would possibly motivate you to want to work on such a thing? How did you get the idea in the first place? I was the overall engineering manager, and Jamie Riotto was the hardware manager of the team that designed it, if that helps any. Jamie's in my connections. What did you want to know? Debbie Morris was the system support specialist for MegaFrame, MightyFrame and MiniFrame in my days. I was the pilot production supervisor and built the first production mightyframes. Before it was thrown to full production. Yes, it's true - I wrote the TCP/IP for CTIX. But I have to admit most of that is lost in the mists of time :). It was a sweet machine though! Hi AJ, so sorry to be so late getting back to you! I saw this message at one point and wasn't able to answer right then. Unfortunately, I recycled my old technical manuals. I worked on only software manuals at Convergent; however, a fellow named Rourke Murphy did hardware manuals and most probably worked on the MightyFrame. I'm trying to remember other names, too. Rourke's name just popped into my head -- haven't thought about him in a long time; have no idea where he might be now. If I think of other names, will send along to you. Actually, I began my Convergent career working with Mini, Mighty, MegaFrame products, but from a software standpoint. I actually had to transfer out of that writing group due to a terribly, unexplainably mean boss. I transferred out to WorkSlate, which then crumbled. Then I went to the new AT&T project where we were making a most unique UNIX PC for AT&T. That got produced & our software manuals won critical acclaim. I don't think I even have those anymore! Wow! I guess I had the nesting instinct or some such and cleaned it all out. Sigh. Hey, AJ, have a great day and may you find someone who has those manuals. All very interesting! Thanks for all the discussion about the Mini & Mighty, and of course, MegaFrames. Wow, what a good time! We did do the manuals for the AT&T UNIX PC; and you are right -- We had folks who flew out from New Jersey to meet with us and spend time. I remember Ann LaPorte, John Guarino, Bruce Corbridge (Pubs Manager on the AT&T project), and me. The Office Applications were designed and written by Ann, John, Allene Hairston, and me. Ann took over after Bruce left; Ann then went to MicroSoft in Seattle, along with John. Ann left me in charge. Later when I took over the Pubs group, I remember hiring a fellow to document the device drivers manual. I also hired Eric Norris and Joyce Crowley from Four Phase Systems, Inc. to work on the project. Maria Cherem also worked on the project as an intern. I remember giving a UNIX prof at Foothill College a UNIX PC. He later ran away to India to study with a guru!!! Now there's some logic! The UNIX PC is a tempting offer -- can I get back to you on this? Also, the Mighty. Cheers & thanks again for all of your information on this topic! "Unix Kernel development for Convergent CTIX (Convergent flavor of Unix System V) for their S-Series of Motorola 68K based line of minicomputers." Yes, I was part of Convergent's S-Series CTIX team in the late-80s. But that was so many lifetimes ago, I seriously doubt that I could be of much help with that system now. I do have to admit that reading over the "Writing MightyFrame Device Drivers" manual that you(?) posted to mighty frame.blogspot.com feels strangely familiar, even after decades of working with BSD based and Linux systems. System V still feels like 'home'. PS My MF is different from yours... no lights on the front panel except HDD. Its model "CR-5160-C21", a "Mighty CR". I also have a couple of the rs422 display terminals, but it'll take a while to sort the cables. "What kernel changes were made from UNIX System V Release 3 to support CTIX for the MightyFrame? The Mightyframe ran SysV 2.2, never SVR3." And he shared some fantastic information about boot tapes in this comp.sys.3b1 thread. LinkedIn Profile: "UNIX porting experience and comfort with hardware was useful for a UNIX box shipping operation (Convergent Technologies MiniFrame & MegaFrame)." CTIX! Good grief. Last worked on CTIX and CTOS back in 1986, I think. I've been a Unix kernel programmer, but not for some time. My last serious kernel work would have been in the late 1990's. Used to like those intricate machines, the MegaFrames. IIRC, I held the record for the longest uptime on the MegaFrame, in Europe. The Convergent guys kept them up for longer in the US. Fairly fragile interface to the File Processor, IIRC. The MightyFrame was a lot more like a standard UNIX system - no subsystems running their own OS's, as in the convoluted architecture of the MegaFrame. And no peculiar expansion bus, as in the MiniFrame. But those strange RS422 terminals! Happy to take a look at the problems, but after a couple of decades, I'll be a bit rusty. CTOX equipment - no idea. I'd try eBay and CraigsList, Gumtree, etc. There are also a bunch of people who like old computers. I've come across people who maintain collections of early consoles, of machines that don't have 8-bit bytes (the Elliot 309, IIRC, had a 39-bit word), and strange devices like the Norsk Data Lisp Machines. I do remember talking about ten years to, IIRC, someone from the westernmost of the North West European countries - Denmark, Holland, Belgium, maybe Norway - who was running some 68k kit. Try meetup groups and hobbyists, tech history buffs? The boot problem - Maxtors were pretty noisy. I used to be able to diagnose some common optimisation problems just by listening to the drive head stepper motors. Can you hear a distinctive pattern of stepper head noises before the MightyFrame looks for the tape. There should be a seek pattern where the head is moved across the disk to look for boot sectors. If you're not getting that, then, not sure what's wrong. If there's no distinctive boot-sequence ratcheting noises, then it could be the drive isn't jumpered as Drive 0 (boot drive, IIRC), wiring, the drive, drive contents, Boot ROM (they were, IIRC, Flash - I'm not sure what happens to Flash after 20 years). You're sure that the drive was last used to boot a MightyFrame, and wasn't for example, a second drive used for data? IIRC there was room for several drives in a MightyFrame chassis, and it might never have been formatted as a boot drive. One of the clues would be the original configuration of the drive select jumpers. IIRC, you could jumper a drive to be one of four devices on the bus. I think MightyFrames only booted from Drive 0. Each drive had to have a unique ID, and a drive used in ID 1, 2 or 3 wouldn't have a boot loader on it. IIRC the Convergent OS tapes weren't tar, they were 'cpio'. That was a different archive format, incompatible with 'tar'. The Unix PC came late in the series. If I recall correctly, the first machine was the Burroughs B25/MegaFrame, and the other CTOS based MiniFrame, then the MightyFrame came out, then the UNIX PC. Early UNIX kernels were very hardware dependent. I worked for a while porting UNIX software to over 100 Unix variants. It was very rare, except on the PC based systems, that an installation mechanism and kernel for one system would have any useful impact, even if the processor was the same. I'd be very wary of the idea that a UNIX PC boot/kernel would work in a MightyFrame. MightyFrame, MegaFrame and MiniFrame had radically different kernels, as a consequence of the underlying hardware and expectations. On a MightFrame, for example, the sub-processing systems (File Processors, comms processors, etc) all booted CTOS and then the main CPU would boot to run UNIX, using the FPs to prvide the file system). There'd be little chance that a MegaFrame boot or kernel would be useful for a MightyFrame, MiniFrame or UNIX PC. The MiniFrame... Very strange expansion bus and IIRC a lot of the early boot sequence was probing that bus to find out what was present. My suspicion is that Convergent engineers would think of every machine series as being a unique boot experience, with unique hardware challenges. It probably wouldn't occur to them that a kernel could be used in multiple different motherboards with different buses. I certainly wouldn't have thought that way in the early to mid 80's. It took the PC, with the common motherboard and standardised hardware interfaces, to produce common boot systems that would work comfortably across different vendors' systems, and even in 1994 (last time I actively did kernel work as a paid job), we were still finding PC UNIX installation mechanisms that were part of the whole vendor-lockin model of thinking that lead to hardware-unique boot sequences. Also, the kernel subsystems were statically compiled in. Loadable kernel modules were a later addition - started coming in the early 90's. That made probing for different buses very difficult. I helped debug and solve some cases in 90-94 where hardware conflicts even in a single series of machines, could result in failed device operation, and having to compile hardware specific kernels to make specific combinations of hardware work. So... I'd be very surprised to hear that a UNIX PC install would work on a MightyFrame - unless the core hardware was pretty much identical (same hard disk interfaces, same motherboard memory subsystems, comms chips, etc, etc). Comparing the core hardware specs would be route to go. If there's differences in the devices, different drive interfaces, etc, different CPU, different comms chips, then the chances of success will drop, rapidly. Got to go - working on a project today. I'll try to answer some of your other questions later - but it has been a very long time since I worked on these machines, and I only worked on them for about a year, without kernel code (part of the reason I left - I was effectively used as a support tech, not a kernel capable coder, and the puzzles were limited without kernel code). 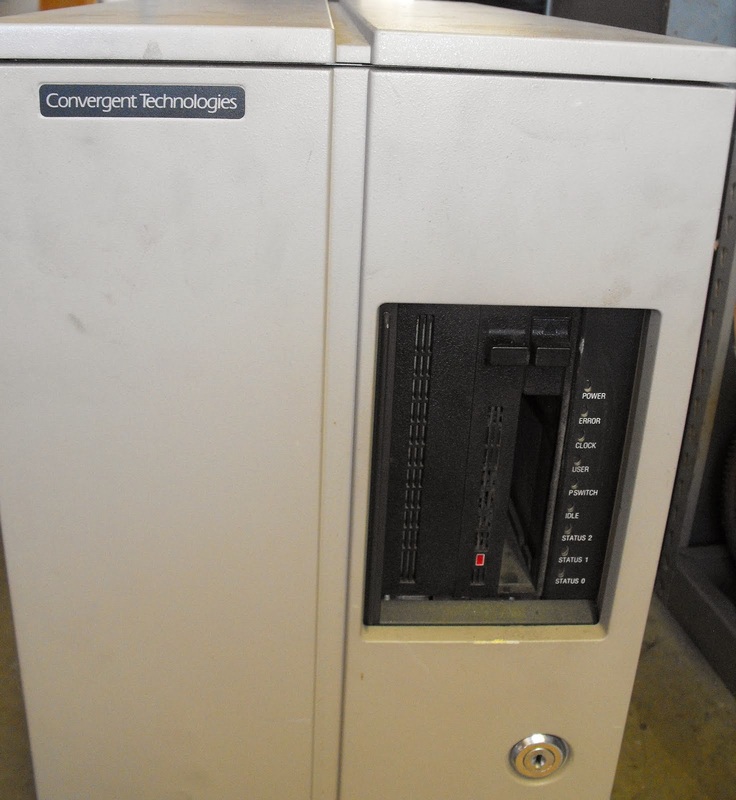 I was a distributor of Convergent Technologies systems for about 4 years until they were acquired by UNISYS. Then we sold Motorola 88030 systems. I actually had a CTIX source tape which they gave me when I asked for support on systems they were phasing out. I also had a number of application tapes like Informix and the desktop office apps. Not to get hopes up - I don;t know if I still have them. I was a bit of an expert of UMODEM and the better MODEM7 programs for file transfer over modems. I even had some of the RS422 terminals . We also used Miniframes - the 68010 systems with 1-4 MB memory. I sold about 30 Mightyframe 640s and 20 Miniframes. We actually wrote a SCSI driver for a third party VME SCSI card for the Mightframe and connected to a Laser Magnetic Industries 12" Glass WORM disk drive for archival storage for use with large manufacturers who made vehicles and aircraft. The tapes were boot choice if the drive was not recognized. I owned a miniframe. I exchanged it, while I was working for CT, for my proprietary software that did total system profiling. I had my Miniframe running well until about 1999 when I simply shut it down because my "windows" environment was more productive. I could have just packed it up and saved it until today, started it up and logged in. I seriously doubt that system would be worth anything today. Greg Hansen -- my manager and Jamie Rioto's mgr. Rob Farnum - A compiler person who now lives in Hawaii. who worked for me and NEVER shipped a bug. Shortly before I left, I hired a female operating systems person. I wish I remembered the name because I am certain she excelled during the day when there was never any females applying for jobs in the computer operating systems business. These are the amazing people I remember from Convergent Technologies.